Powerful cleaners and treatments specifically formulated to help septic systems which receive food service and other commercial waste waters. Septic systems receiving waste waters from food preparation areas tend to have high influent levels of FOG, BOD, and sanitizing agents. 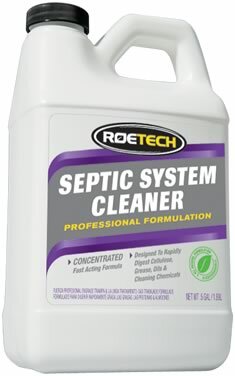 ROETECH Septic System Cleaner is specially formulated to handle "high load" wastes and works throughout the system degrading FOG, proteins, starches and paper in addition to many types of cleaners and sanitizing agents used in the food service industry. Regular use of SSC can help to prevent the clogging of inlets and outlets that can lead to back-ups, overflows and unpleasant odors and is powerful enough to help correct overworked and sluggish systems.